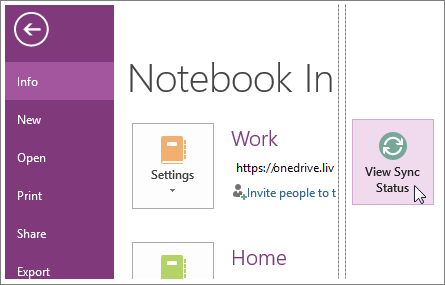 OneNote automatically synchronizes shared notebooks at regular intervals. But sometimes, you may want to sync a shared notebook to make sure your changes get uploaded right away (for example, if you're getting on a plane and need to shut down your laptop). Click File > Info > View Sync Status. Click Sync All to sync all of your shared notebooks. Click Sync Now next to the specific notebook that you want to sync.